The Artley Model 18Q USA Oboe provides a perfect selection for the student oboe player. 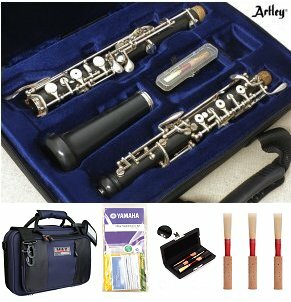 This Artley Oboe coems with a premium accessory upgrade package which includes a Pro Tec Case, 3 Reeds, Reed Case and a Yamaha Oboe Care Kit. Select from 3, 6 or 9 month rental options. Rental goes to monthly billing at the end of the up front rental period you select and you may return at anytime. There is a purchase option with every rental which allows you to apply up to a specific amount of paid rental fees toward the purchase of your instrument. There are economical advantages to paying for a larger block upfront and those options and discounts may be reviewed above.